According to Kruskopf, MyWonderfulLife.com offers a secure online environment where registered users can create a “book” representing their Wonderful Life. As part of this process, users identify six “Angels” who will be notified upon their death. These Angels are given access to the deceased’s personalized book, as well as a summary, which outlines that person’s wishes. The concept of MyWonderfulLife.com came to Kruskopf and business partner, Nancy Bush, when Bush’s husband, John, passed away in 2006. In 1998, Rose Martin died at age 84. Prior to her death she let her friends and family know that she wouldn’t be buried without her 1962 Chevrolet Corvair. Martin had been driving the car around her hometown of Tiverton, Massachusetts for 36 years. 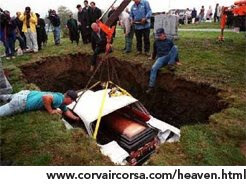 The local body shop had to make some adjustments to the vehicle in order to fit a casket inside, but Martin got her wish and was buried in the Corvair, which took up four funeral plots at the cemetery. Before Henry Ewell died in 2003 he called upon Massachusetts funeral director, Bob Biggins, to arrange his funeral. Since Mr. Ewell was an ice cream vendor, Biggins planned for the funeral procession to be led by his ice cream truck. Mourners were also served a Popsicle at the end of the funeral.